I read many years ago that if you wanted a tree to recognise you, you would need to sit quietly at its base for a week. Very Zen! Yet trees are often seen as quiet observers. Their lives span of hundreds – and in some instances thousands – of years, and they will die at exactly the same location they were born. 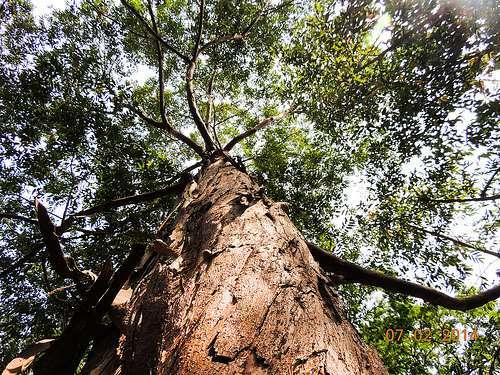 It looks to us like trees have no eyes, ears, heart, voice, nerves, lungs, intestines, blood or brain. But that's not entirely true. Trees are more like us than we might think. Just not in a way we might expect. I am still doubtful that a tree could turn into something that echoes JRR Tolkien's ambulant arborescent creations wandering around Middle Earth. However, the thought is intriguing. It implies that trees operate at very different timescales to ours. To fully grasp how active these organisms are it is worth readjusting our anthropocentric view on them. Today we measure their "breath" to calculate the carbon sequestration capacity of entire ecosystems. By "breath" I mean the process of "taking in" gases from the atmosphere and "letting out" gases produced during their metabolism. These analogies can be extended. Trees "can read the clock" –- by following entrained circadian cycles. Each tree species has its own "language", and can also talk several "foreign tongues", and they even call actively for help if necessary. Here the release of highly specific chemical compounds facilitates communication with other trees, insects or fungi. Trees age, they defend themselves and react to injuries. Indeed, despite missing a heart, trees do have a pulse. Not unlike the circadian rhythms in trees mentioned above, there are a number of processes that follow distinct oscillating cycles. As many of these oscillations are a response to changes in environmental conditions, they typically follow a 24-hour cycle, such as opening and closing of stomata, but some can be annual, like deciduousness. Another example for a diurnal (i.e. 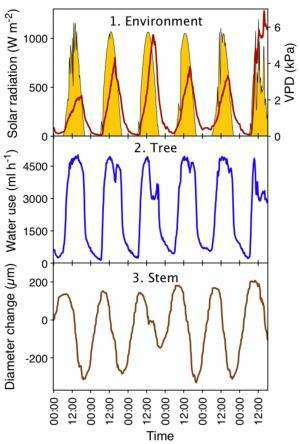 daytime) oscillation is the internal transport of water in tree stems (see image below). This process is driven mostly by light and the "dryness" of the atmosphere (top graph). Trees usually respond to changes in these environmental drivers by increasing their transpiration during the morning and decreasing it during the afternoon and into the night (middle graph). We also record the accompanying dynamic change in diameter of the stem, producing a nice slow pulse (bottom graph). But what "organ" generates the pulse? Nearly 100 years ago reports of this pulse first surfaced when forest scientists experimented with machines that aimed to measure the growth of stems. After many tests, in 1932 Lester Henry Reineke finally invented the first precision dendrometer, which measures the girth of a tree stem. By using this instrument it quickly became clear that tree stems shrank during the day and expanded during the night based on changes in water stored in their tissues. 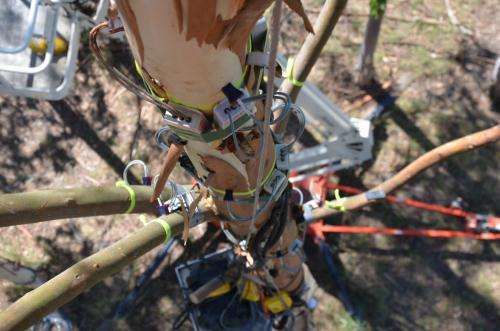 Lately researchers have found that the pulse is mostly generated by diameter fluctuations in the bark only. This was somewhat surprising, as traditionally it was thought that bark is totally decoupled from the transpiration stream of the tree. To better understand this mysterious situation, we need to have a closer look at the bark. Bark can be divided into a dead (outside) and living (inside) section. The living section contains a transport system called phloem. The phloem relocates sugars – produced during photosynthesis in the leaves – to tissues, which require sugars for energy. This source-to-sink direction of transport leads for most of the time to a downward directed stream of sugar-rich sap in bark towards the roots. The phloem uses water as transport medium for these sugars, and under certain conditions it appears that this water can be drawn out of the phloem into the transpiration stream of the stem. Using theoretical modelling, plant biologists were able to show that these conditions are most likely to occur during the rapid increase of transpiration in the morning hours. During this time, the tension in the capillaries that transport the water upwards in the the stem rapidly increases. Just like a rubber band, too much tension would cause the water column inside the capillaries to snap, which has quite nasty consequences for the tree. In fact, this is how trees can die during drought. To prevent this snapping, water from phloem is drawn into the capillaries, and the loss of water from the phloem causes the stem to shrink. Once the tension in the capillaries declines as a consequence of decreasing transpiration, the formerly lost water will be replaced back into the phloem, and so the stem expands again. All this might sound pretty sensible. However, the exact pathway of this water transfer has remained a mystery. And it is here where a recent study that I led comes into play. My colleagues and I injected fluorescent dye into phloem, and we were able to visualise the exact pathway of the water. We found that this water transfer takes place inside the wood rays that connect the phloem with the water-conducting capillaries (see image below). These are radially aligned living ray parenchyma cells that are present in countless tree species. Our experiments have now established that phloem indeed is linked to the transpiration stream, acting like a sponge that gets saturated and squeezed continuously. So, as it turns out, trees really are quite like us. They even have a pulse. You just have to sit next to one for a week to feel it.